Grace Flandrau was a contemporary of F. Scott Fitzgerald, sharing both a hometown -- Saint Paul, Minnesota -- and an editor, the legendary Maxwell Perkins. She wrote six books -- three of which were turned into movies -- and more than four dozen stories. Kyle Crichton, Scribner’s associate editor, told her, “You belong with the very first of American writers.” During her life, she was one of Minnesota’s best-known authors, with her own radio show and a weekly column in the St. Paul Dispatch. And yet, she remains in history’s shadows. 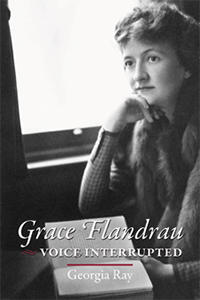 In this landmark biography, Georgia Ray tells the story of a remarkable woman and explores Flandrau’s fall from literary and social grace.